Bishop, Doctor of the Church and Founder of the Order of Redemptorists. St. Alphonsus, model of piety from tenderest youth, Pray for us. St. Alphonsus, scourge of heresies, Pray for us. St. Alphonsus, defender of the Catholic faith, Pray for us. St. Alphonsus, always occupied in evangelizing the poor, Pray for us. St. Alphonsus, tender comforter of the afflicted, Pray for us. St. Alphonsus, instructed in the Divine art of converting sinners, Pray for us. St. Alphonsus, enlightened guide in the path of perfection, Pray for us. St. Alphonsus, who became all things to all men, to gain all for Jesus Christ, Pray for us. St. Alphonsus, new ornament of the Religious state, Pray for us. St. Alphonsus, bold champion of ecclesiastical discipline, Pray for us. St. Alphonsus, model of submission and devotion to the Sovereign Pontiff, Pray for us. St. Alphonsus, who didst watch unceasingly over the flock committed to thee prayfor us. St. Alphonsus, full of solicitude for the common good of the Church, Pray for us. St. Alphonsus, glory of the Priesthood and of the Episcopate, Pray for us. St. Alphonsus, shining mirror of ail virtues, Pray for us. St. Alphonsus, full of tenderest love for the infant Jesus, Pray for us. St. Alphonsus, inflamed with divine love whilst offering the Holy Sacrifice of the Mass, Pray for us. St. Alphonsus, fervent adorer of Jesus Christ in the Holy Eucharist, Pray for us. St. Alphonsus, penetrated with lively compassion while meditating on the sufferings of our Divine Saviour, Pray for us. 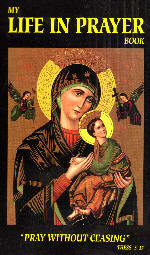 St. Alphonsus, specially devoted to the Blessed Virgin Mary, Pray for us. St. Alphonsus, favored by apparitions of the Mother of God, Pray for us. St. Alphonsus, leading an angelic life, Pray for us. St. Alphonsus, a true Patriarch in thy paternal solicitude for the people of God, Pray for us. St. Alphonsus, endowed with the gift of prophecy and miracles, Pray for us. St. Alphonsus, an Apostle by the extent and fruit of thy labors, Pray for us. St. Alphonsus, a Martyr by thy austerities, Pray for us. St. Alphonsus, a Confessor by thy writings full of the Spirit of God, Pray for us. St. Alphonsus, a Virgin by thy purity of soul and body, Pray for us. St. Alphonsus, a model of Missionaries, Pray for us. St. Alpbonsus, our tender father and powerful protector, Pray for us. Lamb of God, Who takest away the sins of the world, Graciously hear us. O God, Who by the Blessed Alphonsus Maria, Thy Confessor and Bishop, inflamed with zeal for souls, has enriched Thy Church with a new progeny: we beseech Thee, that taught by his saving counsels, and strengthened by his example, we may happily come to Thee. Through Christ, our Lord. Amen.